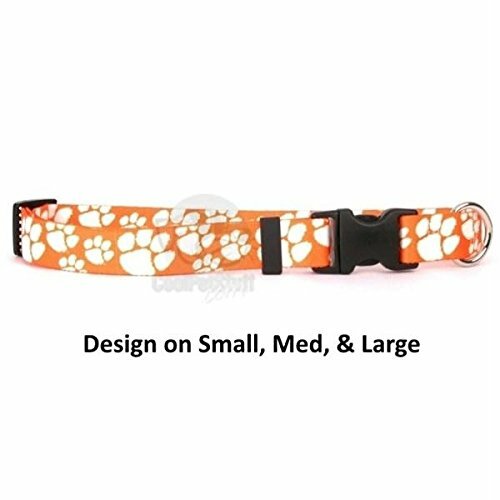 Show support of your favorite team with this adjustable nylon officially NCAA licensed pet collar! This collar closes with a hard plastic locking clasp for easy access on and off. Best of all they are washable!Officially licensed productMade of vibrant color-fast polyesterAdjustable sizing Sturdy quick release plastic claspSecure non-rust D-ring for tag and leash attachment100% guaranteed by the manufacturer against defects chewing fading and frayingWashableImportant Note: Size XS has a different design than the other sizes due to the collar width being too narrow to fit the design used on other sizes. Please see pictures for details.SIZEWIDTHNECKXSmall3/8 inch8"-12"Small3/4 inch10"-14"Medium3/4 inch14"-20"Large1 inch18"-28"